On Saturday January 26th 2019, athletes and coaches from 11 Muaythai Ontario member clubs merged together at Kombat Arts in Mississauga, Ontario for the third installment of the Canada Youth Movement, a developing light contact exhibition event for youth athletes.The initiative, co-created by Rommel Oliveros and Joey de Los Reyes, with the guidance of Muaythai Ontario, is geared towards developing the skills of our youth athletes by giving them ring experience while building camaraderie between athletes and clubs in the amateur Muaythai community. The need for events of this nature stems from the provisional recognition Muaythai was given by the International Olympic Committee in 2016. Muaythai is gaining more recognition now more than ever internationally, and the possibility of it being an event at the Olympic Summer Games in Paris is tangible. That being the case, the Games are just over 5 years away, and a lot of work has to be done to prepare Canada’s medal hopefuls for the top international competition that awaits them. Having light (no head) contact, Olympic style Muaythai scrimmaging is exactly what the sport and its athletes need in the province in order to be competitive at the top international events such as the IFMA World Championships, and the Olympics, when that day comes. Not only does an initiative like the Canada Youth Movement develop our youth, it strengthens our community. The event on January 26th was much larger than the previous two. Nearly 60 athletes enrolled in the exhibition, with over 50 bouts scheduled to take place. Gyms from as far as Barrie and Bruce County made the chilly drive to show their support by participating. While Muaythai is a combat sport, the culture behind it is grounded in sportsmanship and a mutual respect between athletes. Only those who have competed in Muaythai truly know how hard it is, and this is precisely why athletes show each other so much respect. They are conjoined by this love of the sport, embodying the fundamental characteristics at the core of its culture. One might simply call it, ‘esprit de corps’. The positive effects of the Canada Youth Movement have already been demonstrated. Coaches observed that athletes competing in last October’s Muaythai Canada National Championship came to the event with a stronger base knowledge of techniques at the ‘C’ class level. The young athletes appeared more confident and technical in their respective bouts. This is just one of many positive benefits that an event like the CYM offers. With the support of our community, the Canada Youth Movement continues to gain significant traction. 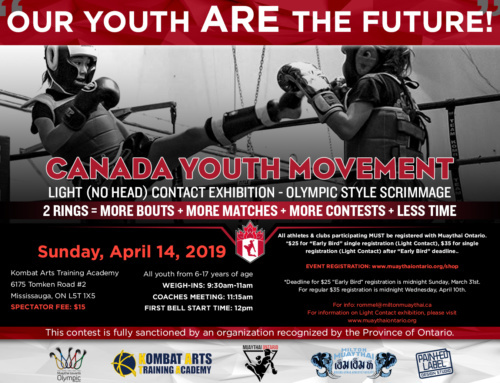 Rommel Oliveros (owner of Milton Muay Thai) and Joey de Los Reyes (co-owner of Kombat Arts) have done their part by laying the foundation for other Muaythai Ontario members to join forces, and literally give our youth a fighting chance should they choose to represent Canada at the highest level of amateur competition. At the very least, the Canada Youth Movement brings people together, using competition in the sport of Muaythai to teach our youth about respect, hard work, and sportsmanship. It’s a win-win, even if they’re exhibitions. Follow Canada Youth Movement on Facebook and Instagram to see more photos of the event! 2019 Annual Community Meeting Coming Up! Canada Youth Movement is Back!